1 edition of The Price to Pay found in the catalog. Add another edition? Are you sure you want to remove The Price to Pay from your list? 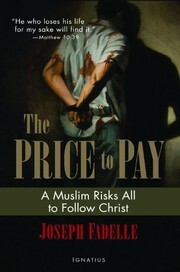 Published October 3, 2012 by Ignatius Press in San Francisco, California, USA . The Price to Pay is the true story of Joseph Fadelle's conversion to Catholicism. He risks everything--family, friends, his inheritance and home, and even his life--in order to follow Christ. In a dramatic and personal narrative style, Fadelle reveals the horrible persecution endured by Christians living in a violent and hostile Muslim world. "The Church Asks You to Leave"
"Zeal for Your House Will Consume Me"
"French, the Language of God"
December 8, 2017 Edited by Todays Martyrs Reviewer Edited without comment. December 8, 2017 Created by Todays Martyrs Reviewer Added new book.